Did you know that 90% of of the signs of aging comes from the sun? This healthy habit is a no-brainer. I’ll admit that there were a handful of years in my mid-20s when I decided (for no good reason at all) not to replenish my daily sunscreen once the bottle ran out. Days without it became months, and months for some reason, easily ran into years. What a mistake! And I promise I’m not making that mistake again. It’s a personal promise I’m hoping to pass along to Lucia too: infusing SPF into the morning routine. Lucia’s always asking to “share” my face creams, so this is one that I’ll actually let her use and it’s one that Lucia and I can enjoy putting on together every day. 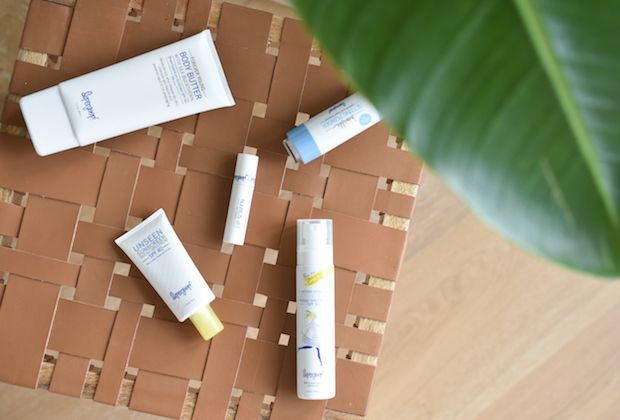 Because daily SPF is the single best thing we can do for our skin. I’m excited to be partnering with Supergoop! today to help spread this important message and share my love for their newest product: Unseen Sunscreen with Broad Spectrum SPF 40. It’s invisible, light as a feather and spreads so smoothly and effortlessly. (Moms and dads, you know what I mean when spreading SPF on our little ones can be a challenge – this one is the best!) It protects against everything: UVA, UVB, blue light and infrared. Plus it’s colorless(! ), scentless and oil-free. PS: Supergoop! also makes products that help with sunscreen re-application too, without messing with our makeup: Defense Refresh Setting Mist SPF 50 and 100% Mineral Invincible Setting Powder SPF 45. Because the sun’s still shining all day long and our protection needs to last that long too. Thank you Supergoop! for partnering with me on this post. Supergoop! products are available below, and also at Sephora. I’ve heard so many great things about this sunscreen! I might need to try it out on my next trip! This stuff looks like a great product! Oh how cute, I love ❤️ the name already. Supergoop! Where is that beautiful top from? Love the ruffle details. Yes, my mom made me start wearing SPF on a daily basis starting in my teens, and I can’t thank her enough for the advice! 🙂 <3 So glad you're doing the same with Lucia! Sunscreen really is sooo important! If I may, I would confidently recommend ObeyClothing.com to anyone who is looking to update their look or just needs to rediscover their love of clothes. They have a very good collection of men’s graphic tees.